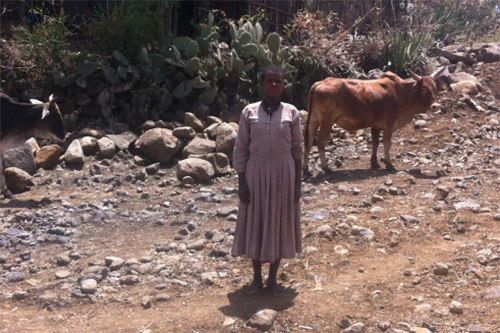 In 2016, during our visit to the Ethiopia we witnessed first-hand the devastation the El Nino drought, the worst in 50 years, had on children and their families in North East region of the country. The persistent poor and erratic rainfall caused most streams and springs and hand-dug wells, in short, all the normal sources of water, to dry up. This put families, communities, livestock, crops – the whole environment – under pressure even to survive. Women in communities here are the gatekeepers to addressing the nutritional needs of children. They are the ones who grow and prepare the crops at home and ensure there is diversity in a child’s diet. Women are also more likely to spend their incomes on food and children’s needs – research has shown that a child’s chances of survival increase by 20% when the mother controls the household budget. Over 1300 families who were most severely affected by the drought received 5kg of chickpeas and bean seeds each. We supported 24 women from four separate women’s cooperatives to receive training in nutrition. We were able to support a Womens Agriculture and Farming Cooperative to complete a small-scale irrigation system and provide them with a pump necessary to lift the water from the river.